You can find a lovely, private summer cottage or holiday home in West Jutland from the lovely island Fanø and Blåvand Strand in the south to Thyborøn in the north - an approx. 200 km long stretch with the most wonderful beaches and landscapes on the westcoast of Jutland along The North Sea. North of Esbjerg, the big harbour city you find along the coast Blåvand, Vejers Strand, Grærup Strand, Henne Strand - all wonderful places with a lot of cottages and a find bathing beach. In the great nature area around Ringkjøbing Fjord you find Nymindegab, Bork Havn, and on the long isthmus between the North Sea and Ringkøbing Fjord you pass Bjerregård Strand on the way to Hvide Sande with the large fishing port and the channel in to the Ringkøbing Inlet. On the completely special and wonderful Holmsland Klit you find Klegod, Sønder Lyngvig og Nørre Lyngvig. North of Ringkøbing Fjord exists Denmark's largest summer cottage area with the holiday village Søndervig, Lodbjerg and Hovvig, which has everything for an exciting summer vacation with many experiences. Near Nissum Fjord you find Vedersø Klit, Fjand and Thorsminde with many family-friendly summer cottages for rental. North of Nissum Bredning the beautiful cliff Bovbjerg and farther north Vrist and Vejlby Strand before you come to Harboøre Tange with the fischerharbour Thyborøn. On this entire long stretch the holiday cottages lie not far from the wonderful North Sea - some places with a narrow beach, but many places with more child-friendly beaches, where you can enjoy the summer weather with sun bath on the beach or make long, fresh trips, where one forgets everything but seeing and hearing the waves' eternal sounds. West Jutland is a wonderful place for a golf weekend or summer vacation for the whole family. 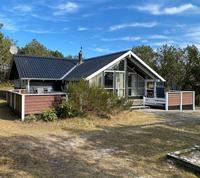 We wish you a very nice holiday in a private, cosy holiday home in Denmark - maybe in West Jutland! Nice luxury cottage in Bork port affordable for rent. With all conceivable equipment. The house is 90 m2 and built in 2004, it includes 3 bedrooms, all equipped with double beds. The house appears as new throughout. Lovely large 1200 m2 land. Lovely newly refurbished house near the North Sea and Nissum Fjord. The house has a large, secluded terrace. Playground in the wood approx. 100m from the house. Free Internet. cottage, 135 m2, for 6 persons. Great views over town, harbour and Limfjorden. Central location, 5 minutes walk to harbour and shopping. 10 minutes by car to the beach. 15 km from the North Sea. Very usefull all-year. See more cottages in Westjutland - find them by searching in the seach form above.